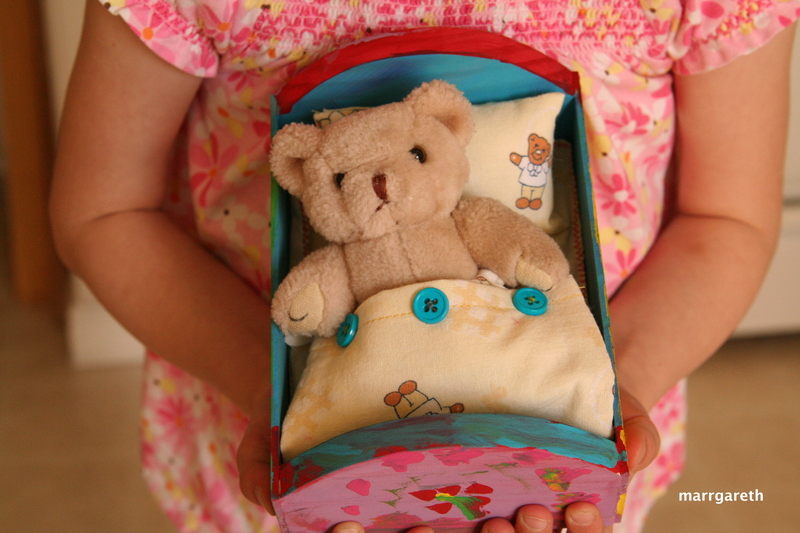 A few days ago my daughter and my son made beds and bed sets for their teddy bears. It takes a whole one day to do that. You can see the final effect below. Using hammers and nails they handmade the beds, then they painted them. When buying paints for kids, remember they have to be non-toxic. Instead of using brushes use small sponges on sticks, they are much easier to work with. When the paint was drying we decided to design the bed set. We measured the crib and wrote the numbers down. We found some fabric at home, an old pillow case, which we no longer use. The design was my task and challenge. It was not easy at all, for how to design a bed set which your ~3 year old will be able to make? After 15 minutes of thinking I had an idea in my head. We started working. 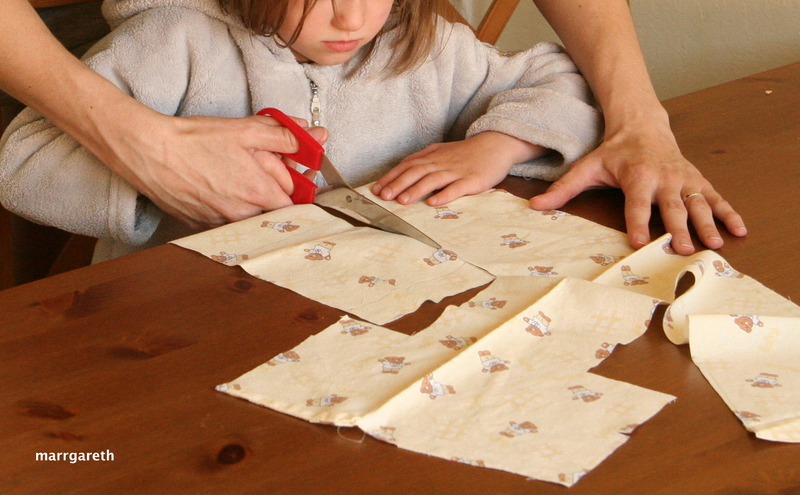 We made the sheets without hemming, we used a zig-zag stitch instead. The pillow case and the comforter cover only have straight stitches. We did not make buttonholes, the buttons are just for decoration. Kids chose the buttons, of course. Oh, the most important thing, when we were cutting the fabric we used existing parts with hemming so we did not have extra work. Kids stuffed the pillow cases and comforter cases with some filling. How did my kids sew the set? It was easy, they were sitting on my laps and held the fabric with me. I have the start/stop button so my kids could start and stop the machine by themselves. 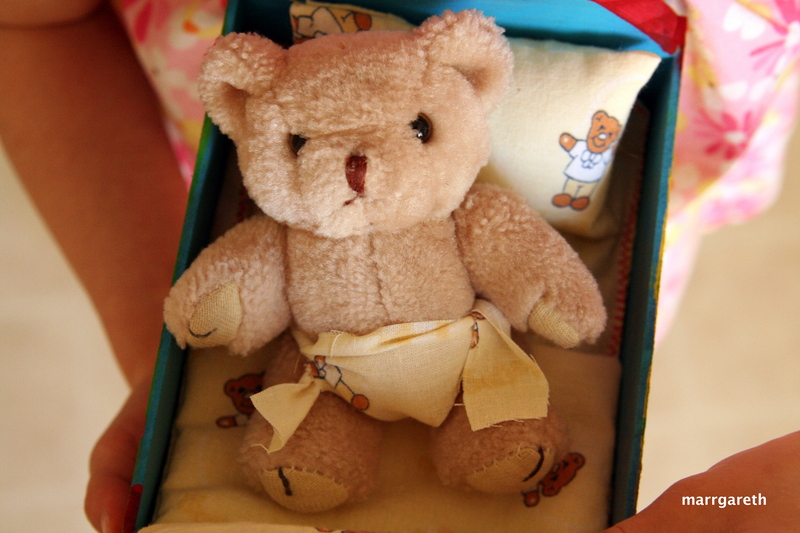 At the end we decided that baby bear needed a diaper. We cut the diaper from the same fabric as the bed set. I hope it was an inspiration for you guys! 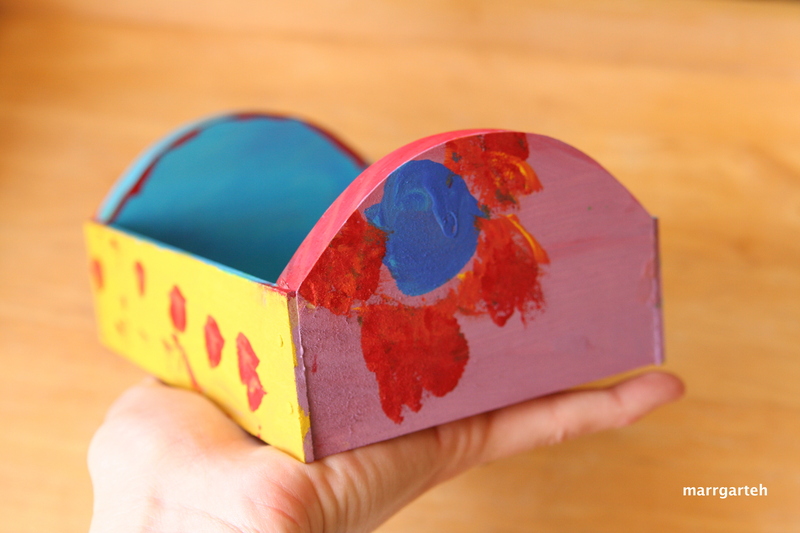 very cute, what an inspiring project, so good to get kids making things at an early age. Loved crafting with my kids, wasn’t sure if my son was always thrilled but as a grown up he has his own workshop in his garage and likes to design and build things for his house, I like to thinks I had something to do with that! Oh, that’s gorgeous! And a great idea for some scrap fabric I’ve got tucked in my crafting box! What a cute idea – reminds me of the house my babysitter made for my troll dolls. Definitely pinning this one!